"My research suggests that GoPro is not having a good holiday season. Consequently, I don’t think fourth quarter numbers will be that good. Considering more than a third of this year’s revenues are expected to be generated in the fourth quarter, bad Q4 numbers could send the stock to new lows." "GoPro’s Bad Holiday 2017 It doesn’t look like GoPro cameras and drones are selling that well this holiday season. 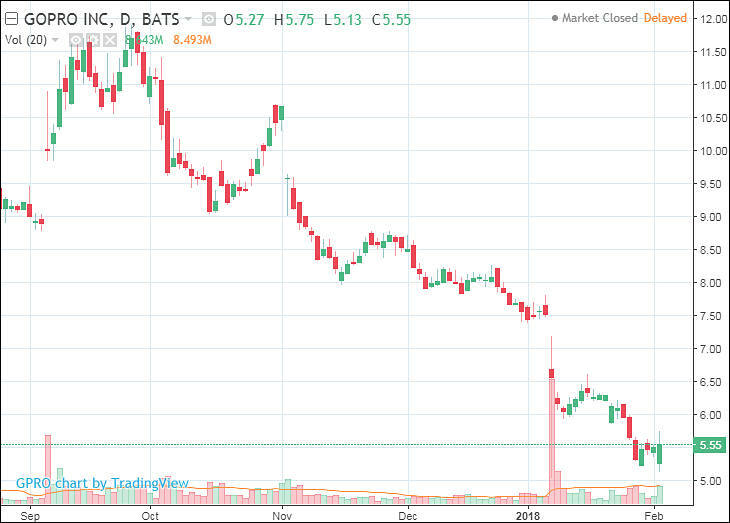 While GoPro cameras are the best-selling action camcorders at Best Buy Co Inc (NYSE:BBY), it looks like this whole action camera space is shrinking. Just look at search interest trends for GoPro’s cameras over time. Each new product launches to less fanfare than prior products. The Hero4 had higher search interest than the Hero5, which had higher search interest than the Hero6. This is a bearish trend that only accelerated this year, implying GoPro action cameras aren’t a popular gift item this year." Here in Norway the biggest consumer electronics retailers have started a price dump on the Hero6 which is now rebated by more than 100 euro. The Yi 4k+ costs around half the price (with about 95% of the features) of the Hero 6 and is not plagued by random lockups/video corruption - and modern phones have decent 4k video and are waterproof. The Karma drone costs close to the same as the Mavic and is generally seen as being inferior... it's not surprising that GoPro are having some trouble. The Yi is quite amazing. I am not surprised by this turn of events for GoPro. Their NAB booth was a lot smaller. They never have been the best bang for the buck. Of course there are several factors: action cam market might be shrinking, competition is growing etc. But the 50% price increase of the Hero6 compared to the Hero5 here in Europe is probably not helping. But apparently this premium pricing is GoPros move into profitability. Or so they belived. All this by switching SOC from Ambarella to an custom design by Socionext. Which is rumored to be cheaper. Never mind the endless complaints about more noise and other issues which seems to prevail even with the latest 1.60 firmware update. "GoPro is in the process of laying off around 200-300 employees this week, TechCrunch has learned from sources close to the company. The hits to the company were largely concentrated in its aerial division, the segment of the company responsible for its Karma drone. TechCrunch has been informed by sources that the company relieved impacted employees of duties today but will keep them on the payroll until February 16, likely planning to hold this news for after CES and perhaps tie it to an upcoming earnings report as in past instances." Is this the end of the GoPro Karma drone? Permanent 100 USD price drop on the Hero6 today. Now 400 USD. I looks like an disaster in the making. Cash flow is probably catastrophic for the company. If you add up the 300 person layoffs and recent price cuts on the hardware the total is not nice for the strugling company. "GoPro today released preliminary fourth quarter 2017 results which paints the company in struggling situation. The company says it plans to reduce its headcount in 2018 from 1,254 employees to fewer than 1,000. It also plans to exit the drone market and reduce CEO 2018 compensation to $1." "GoPro says in today’s announcement that it expects its fourth quarter revenue to be $340 million, a roughly 37% decline over 2016 levels. The company says a the revenue includes negative impact of approximately $80 million for price protection for its Hero, Session and Karma products." AN MATEO, Calif., Jan. 8, 2018 /PRNewswire/ – GoPro, Inc. (NASDAQ: GPRO) today reported certain preliminary financial results for the fourth quarter ended December 31, 2017. GoProexpects revenue to be approximately $340 million for the fourth quarter of 2017. Fourth quarter revenue includes a negative impact of approximately $80 million for price protection on HERO6 Black, HERO5 Black and HERO5 Session cameras, as well as the Karma drone. "My call? GoPro is bought by DJI or Samsung this year, runs for a brief moment as a standalone product, and then is folded into the company proper. It’s a respectful end to a wonderful product whose golden days are past." GoPro (NASDAQ:GPRO) announces that COO Charles Prober will leave the company effective February 16. SVP and General Counsel Sharon Zezima resigned from the company effective March 30. "GoPro (GPRO -10.9%), one of today's top losers after slashing its Q4 revenue forcast, heavily discounting its Hero6 cameras and planning layoffs, is trimming losses after CNBC reports the company has hired JPMorgan to put itself up for sale." GoPro, Inc. (NASDAQ: GPRO) is building on the success of its Plus subscription service with the introduction of new benefits that deliver significant value to GoPro customers at no additional cost. "Plus streamlines the GoPro experience and delivers outsized value for our customers," said GoPro Founder and CEO Nicholas Woodman. "Our subscription business, Plus, has proven popular with consumers and the roll out of our enhanced service marks the first of several subscription initiatives we will introduce this year." GoPro dominates the US with 80 percent of the market by unit volume and 44 percent of Europe. It saw its business grow in China by 28 percent in 2017 and posted a 96 percent year-over-year growth in Japan. GoPro posted net loss for 2017 of approximately $183 million, or $1.32 per share, down from a net loss in 2016 of $419 million. Don't belive the Woodman hype! The sales are BAD and price seems to be the only marketing slogan. The best GoPro ever. At the cheapest price ever. If Apple resorted to this tactics you would though that the company was gooing down. Is there any reason to belive that Q4 2018 will be a better quarter than Q4 in 2017 or 2016 for GoPro? NEW YORK and SAN DIEGO, Feb. 07, 2018 (GLOBE NEWSWIRE) -- Wolf Haldenstein Adler Freeman & Herz LLP reminds all investors that a class action has been has been filed against GoPro, Inc. (“GoPro” or the “Company”) (NASDAQ:GPRO) in the United States District Court for the Northern District of California on behalf of a class consisting of investors who purchased or otherwise acquired the securities of GoPro between August 4, 2017 and January 5, 2018, both dates inclusive (the “Class Period”). Investors who have incurred losses in GoPro, Inc. are urged to contact the firm immediately at classmember@whafh.com or (800) 575-0735 or (212) 545-4774. You may obtain additional information concerning the action on our website, www.whafh.com. If you have incurred losses in the shares of GoPro, Inc. and would like to assist with the litigation process as a lead plaintiff, you may, no later than March 12, 2018, request that the Court appoint you lead plaintiff of the proposed class. Please contact Wolf Haldenstein to learn more about your rights as an investor in GoPro, Inc.
as a result of the foregoing, GoPro was not on track to achieve the financial results it had led the market to believe it was on track to achieve during the Class Period. On Monday, January 8, 2018, prior to the commencement of trading, GoPro issued a press release filed on Form 8-K with the Securities and Exchange Commission (SEC) entitled “GoPro Announces Preliminary Fourth Quarter 2017 Results,” revealing that its fourth quarter 2017 sales were $340 million, significantly below analysts’ projections of over $470 million. GoPro blamed the results on the slashing of prices for its HERO6 Black, HERO5 Black, and HERO5 Session cameras, as well as its Karma drone, during the quarter, which the Company had been forced to engage in to move inventory and which had a negative $80 million impact on revenues. GoPro also disclosed it was cutting more than one-fifth of its workforce and exiting the drone market altogether, requiring it to liquidate the rest of its Karma drone inventory. GoPro had cut the price for its HERO5 Black camera in December 2017 and announced it was now reducing the price of its newly launched HERO6 model to $399 from $499. The workforce reduction would cost GoPro $33 million, mainly in severance costs. Following this news, GoPro’s stock price declined, falling over 12%, to close at $6.56 per share, a market capitalization loss of over $100 million. I jost don't get it. I bought my Hero 6 new for 329.- Euros. I love it. It has canon like skin tones and a image quality far superior to any other action cam i had in my hands. Sonys are great too, but have zombie skin tones. A good color grader could correct these, but straight out of the box the hero 6 has simply the best image. I also liked the Yi 4k+, but slomo and stabilization looks better on the gopros. The price difference is just 50 Euros and totally worth it. I don't understand, why they struggle that hard. The fusion is great too. I think main competition is not Yi 4k+, but cheaper Chinese cameras, including made by Yi. I got curious about the trade-in program since a Hero 6 for $350 might actually be worthwhile. I nearly killed a Yi 4k+ which was clamped to the front of my car as I drove through mud on a rainy day. I can put the Yi in its waterproof case, but that means no gimbal I bought a refurbed session 5 since it's waterproof, but the footage looks pretty shaky, even on a gimbal. I was thinking I'd go find a cheap toy digital camera at a thrift store for the trade-in program, but then I saw this footnote... guess I'll keep my eyes peeled for an old Powershot or similar. SAN MATEO, Calif., April 18, 2018 – GoPro, Inc. today announced the launch of its camera Trade-Up program, offering users in the United States the ability to trade up from any previous-generation GoPro, or any other digital camera, to experience its latest and greatest products. Starting today, anyone in the U.S. can receive $50 off a new HERO6 Black or $100 off Fusion by participating in the program at GoPro.com. GoPro first introduced its Trade-Up program for a limited time in 2017, which only accepted previous-generation GoPro models in exchange for a discounted upgrade to a current model. Nearly 12,000 customers participated in the 60-day promotion. The new and improved Trade-Up program brings back the initiative with major enhancements, including the acceptance of any digital camera and making it an everyday offer. The Trade-Up program is a great way for our fans and customers to upgrade to our newest products and experience how fun and convenient GoPro has become," said Meghan Laffey, senior vice president of product at GoPro. To participate in GoPro's Trade-Up Program, customers should visit the Trade-Up website, select the new camera of their choice, and follow the instructions to return their old GoPro or digital camera. Upon receiving the returned camera, GoPro will process the discounted order and ship the new HERO6 Black or Fusion to the customer. Returned cameras will be recycled responsibly via zero landfill and recycling methods appropriate to material type. To learn more about GoPro's Trade-Up Program, visit https://shop.gopro.com/tradeup . SAN MATEO, Calif., May 3, 2018 /PRNewswire/ -- GoPro, Inc. (NASDAQ: GPRO) announced financial results for its first quarter ended March 31, 2018. "Our first quarter was driven by strong sell-through of HERO5 Black and HERO6 Black, along with the launch of our new $199 entry-level HERO. Initial demand for HERO is promising and we expect it to improve as large retail partners like Target and Walmart begin selling the product in the second quarter," said Nicholas Woodman, GoPro CEO and founder. "Our first quarter performance makes it clear that there is significant demand for GoPro, at the right price. We began to step up marketing programs in March which, coupled with overall expense controls, solid channel management and second half new product launches, gives us confidence for a successful 2018 for GoPro." Revenue was $202 million, down 7% YoY, while unit growth was up 3% YoY. GoPro reduced GAAP operating expenses by $37 million, or 24%, year-over-year. GoPro reduced non-GAAP operating expenses by $37 million, or 28% year-over-year. In 2018, GoPro is targeting non-GAAP operating expenses below $400 million --- a cumulative reduction of more than $300 million since 2016. GoPro is the #1 selling camera in the overall digital imaging category for the 17^th^ straight quarter in North America. 'Plus' subscription service has 147,000 active paying subscribers, up 17% since December 31^st^. GoPro content was viewed 148 million times on social media, up more than 8% year-over-year. GoPro's YouTube channel increased 4% in organic viewership year-over-year with 76 million views in Q1. Shorty Awards. GoPro won "Best Overall Brand on Instagram" at the coveted 2018 Shorty Awards. Instagram Stories Integration announced on May 1 at Facebook's F8 conference. GoPro and Instagram partnered to enable GoPro users to share their content directly from the GoPro App to Instagram Stories. In the US, GoPro held 97% dollar share of the action camera category.